The Coaches' Trophy is displayed before the BCS National Championship game between the LSU and Alabama in New Orleans. College football will finally have a playoff. The college football champion will be decided by a playoff beginning after the 2014 season. "Come 2014, the BCS is dead. 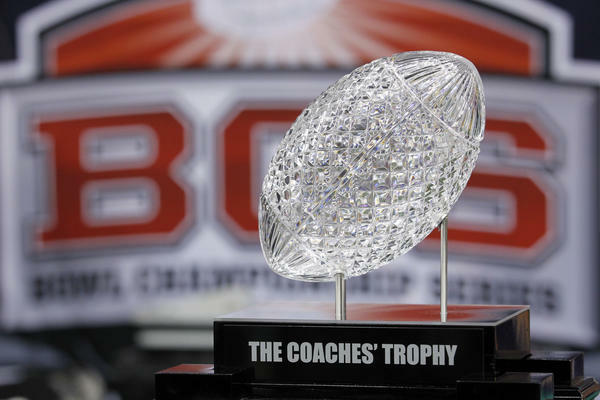 A committee of university presidents on Tuesday approved the BCS commissioners' plan for a four-team playoff to start in the 2014 season. "The move completes a six-month process in which the commissioners have been working on a new way to determine a college football champion. Instead of simply matching the No. 1 and No. 2 teams in the country in a championship game after the regular season, the way the Bowl Championship Series has done since 1998, the new format will create a pair of national semifinals. No. 1 will play No. 4, No. 2 will play No. 3." As we've reported this has been discussed for a while now. College football's combination of computer and human polls to decide bowls has sustained withering criticism. Earlier today, the presidents heard the pitch for a four-team playoff series and decided to give the go ahead. Those four teams in the semifinals will be selected by a committee, "similar to the way the NCAA basketball tournament field is set," the AP reports. "Commissioners presented the plan for 30 minutes then took questions from the presidents, who then deliberated for about three hours before announcing their approval. "'This was timely, had to be done,' former Big 12 acting commissioner Chuck Neinas said before Tuesday's meetings began. '(It was in) response to the public, response to the interest in college football. The BCS has done a great deal in helping promote college football, and there's a general feeling we need to do something better to determine a national champion.'" ESPN reports the semifinals will rotate among "six bowl sites" and the championship game will rotate "among neutral sites." ESPN CollegeFootball tweets that the national championship game "will be awarded to highest bidder." The big unknown is how teams will be selected.